Romanesque Cathedrals in Puglia is part of the Tentative list of Italy in order to qualify for inclusion in the World Heritage List. I visited 4 cathedrals from 6 in total: (1) S Nicola di Bari (extremely impresive exterior&interior with the tomb of St. Nicholas), (2) Cattedrale di Bari (massive buildings with large number of fine romanesque details), (3) Cattedrale di Bitonto (I would say the typical example of romanesque Apulian Church, though the refined version of S Nicholas, with rich decoration and excavated fine floor of its predecessor with famous mosaic of Bitonto Grifone), (4) San Corrado in Molfetta (old cathedral - there is alse a new one in the town; it is quite small, maybe not such impresive but it has byzantine structure with three domes in the main nave). What I know from the literature the quality of Catttedrale di Ottranto can be found in the unique mosaic floor, and Cattedrale di Troia has decoration inspired by Tuscany style such as Pisa and it is famous for the rosetta window in the west facade. In conclusion, I think that this ensamble deserves to be included to the list, because of its quality and merging together styles from other parts of Italy (Pisa), Europe (Normandy, France), and Byzantine culture. When visiting Puglia, I ended up staying in Bari for two nights. Bari has a small old town, nice, but not spectacular compared to the sites of the area. 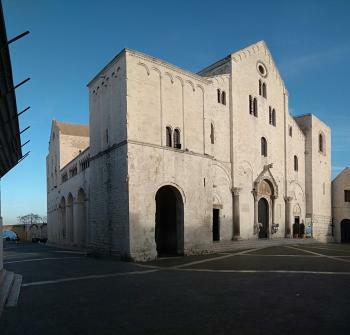 Two churches in Bari are part of the tentative site "Romanesque Cathedrals in Puglia". The churches in Bari also came recommend by a colleague, so I went and visited. Specifically, the Basilica di San Nicola left an impression: It's a blend of a church with a castle and the dimensions seem very off. My picture bears a bit witness for this as I had to use panorama mode to capture the full site. These churches sure are nice and if you pass through Bari go and visit. But I am not convinced that they should be inscribed. Norman architecture is covered by the site in Sicily. And documenting each local flavor of a given style cannot be the point of world heritage sites. And my usual complaint: I don't like serial nominations all that much. Bari is well connected with all of Italy and the local transport hub for Puglia. You will probably pass through when visiting Puglia and the nearby WHS: Alberobello, Matera, and Castel del Monte. All WHS can be done on a day trip from Bari. In addition, you can travel to Monte Sant'Angelo, part of the Longobard places of power. There are two other TWHS in the area: Lecce (strong recommendation to go and visit) and the Karstic Caves of Puglia.